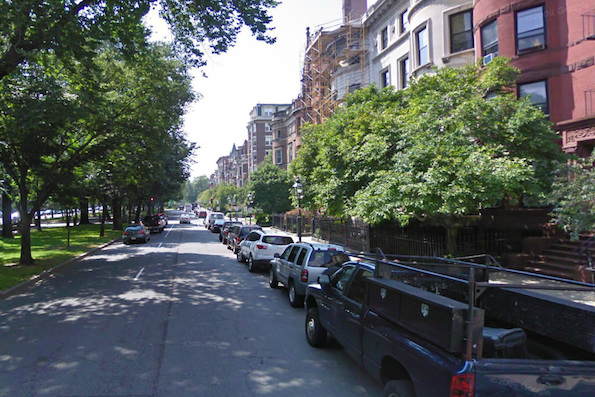 The Back Bay area of Boston is not only one of the most sought after districts of the city with regards to property but also one of trickiest places to park. Evidence of this was unearthed last week when a heated auction sent the price of a tandem parking spot soaring to $560,000 or nearly £360,000. The Boston Globe reported that the parking spaces behind 298 Commonwealth Avenue are in a neighbourhood that is already home to the city's most expensive spaces. A space at 48 Commonwealth Avenue set the record for a single spot at $300,000 in 2009. Two tandem spots a block from the Public Garden on Commonwealth Avenue sold for $200,000 last summer, and a spot on Marlborough Street went for $250,000 in December, according to the real estate firm Cabot & Co. This rare opportunity to own prime parking space big enough for two vehicles came courtesy of the Internal Revenue Service, which seized the spaces from a man who owed nearly $600,000 in back taxes. He bought the spaces for $50,000 in 1993. Bidding for the red-hot real estate started at $42,000 but soon shot up to six figures when two competing parties battled it out to own one of the most exclusive parking spots in Boston. The winner, Lisa Blumenthal, who lives in a family home with three parking spots on Commonwealth Avenue valued at more than $5.8 million, according Cabot & Co told the Boston Globe, "It was a little more heated than I thought it would have been." She added that she was going to use the spaces for guests and workers.